For many nonprofit leaders, working with an executive search consultant is unfamiliar territory. How much should I share? What can I do to present my best self to the consultant? How formal do I need to be? Cultivating a relationship with a search consultant can seem confusing. On the one hand, this person represents the organization that’s considering you for a position. On the other hand, they operate outside of the organization and represent an external perspective during the search process. To help clear up the confusion, we put together advice for candidates building relationships with executive search consultants, based on the experiences of the Campbell & Company Executive Search team. In many ways, working with a search consultant requires a similar approach as communicating with an internal stakeholder at the organization—but there are key differences. Read on for six ways you can cultivate a strong candidate-executive search consultant relationship. Timeliness and accessibility are important in communicating with anyone during a job search, and search consultants are no exception. You are being assessed not only during official interviews, but also during your time working with a search consultant. In this spirit, be sure to check your email and voicemail regularly. If you’re going to be out of town or otherwise unreachable for more than a couple days, give the consultant a heads up. Likewise, if you favor one communication method over another, be sure to share that information. We’ve had candidates who prefer to text, and that’s just fine as long as we know what to expect. When you’re communicating with a search consultant (whatever the method), be sure to listen or read the communication fully before responding. Attention to detail matters greatly in these conversations. For instance, if the consultant asks about your past fundraising performance, they want a thorough, but concise explanation with concrete examples and metrics. Let your guard down around the search consultant—but stay professional. While search consultants are taking note of how candidates respond and behave, you can communicate with the consultant differently than you would with an employee of the organization. Yes, the consultant is always representing the organization, but you can be open with them. On your first call with the consultant, we encourage you to be as candid as possible. The more the consultant can learn about you and what you’re looking for, the more they can work with you to find the opportunities that align best with your goals. If you’re not a good fit for the position in question, the consultant can keep you in mind for future opportunities. If relocating is a deal breaker or if the salary range is far below your expectations, be upfront about it. You’ll build a stronger relationship with the search consultant by being transparent and respecting their time. In later stages, consultants can also act as a resource for the candidate, sharing advice on how to interact with the organization and how to navigate sensitive situations like salary negotiations. Asking something as simple as “Should I wear a suit or are they more casual?” can put you in a better position with the organization. Be realistic in what you pursue. As you work to be candid with the search consultant, make sure you’re also being candid with yourself. Are you pursuing a position that is a realistic move or are you under-equipped? A job that allows room for growth is a good thing, but that growth must be within reason. If you’re vastly underqualified or the position is on a completely different scale, wait for a job opening that better fits your experience. It’s also acceptable to contact a consultant about a position and acknowledge that you may not be qualified for this role. Let them know that it’s the type of position you aspire to, so if there is a similar opportunity on that path, you’d love to be kept in mind. We recommend using this general benchmark: if you lead a team with a budget two thirds the size of the new organization, you can realistically scale up a third. For example, if your division has a $6 million budget, you can reasonably apply to lead an organization with an $9 million budget but not one with a $20 million budget. Make it easy to work with you. We understand that moving through a search process can be stressful, but it’s always in your best interest to be a low-maintenance candidate. Search consultants appreciate this. It gives them a positive impression of you and helps you build a stronger relationship. There are many ways that you can make it easy on the search consultant, but first and foremost is respecting their time. Consultants know that scheduling calls outside of business hours is usually easiest for candidates, but try to take some conversations within that 9 to 5 window. When you do have a call scheduled with the consultant, stick to the time allotted—it’s frustrating if a 30-minute call becomes an hourlong discussion. Share the necessary information but avoid long-winded responses. Similarly, be self-aware when you ask questions. The consultant has many of the answers, but they aren’t internal employees. Avoid questions that are highly specific to the innerworkings of the organization, especially at the beginning of the search. If you progress, you’ll have ample time to discuss your assets and gather information from the organization. Follow the rules of the search. Beyond being responsive, candid, and low maintenance, you also need to be a rule follower. This may seem obvious, but many candidates stray outside the lines. Ultimately, it impacts their relationship with the consultant and their standing in the search. 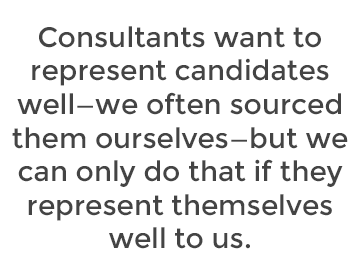 Consultants want to represent candidates well—we often sourced them ourselves—but we can only do that if they represent themselves well to us. A common problem arises when candidates try to circumvent the process and communicate with the client directly. Even if the candidate is internal or has a strong personal connection to the organization, they still need to respect the process and work within its boundaries. Instead of going over anyone’s head, ask the consultant if you want to deviate from the established procedure. It might be fine under the circumstances, and by asking, you’ve built trust instead of breaking it down. In our search practice, we also ask our clients to maintain similar boundaries. Our final piece of advice encompasses all the other recommendations: keep it up throughout the search process and throughout your candidate-consultant relationship. Good candidates are consistent over the long haul. If you’re on one day and off the next, this is cause for concern. How will you perform a month, year, or two years from now? Conversely, if you’re steady—remaining responsive, detail-oriented, realistic, etc.—from week to week during the search, you instill confidence in the search consultant and in the organization itself. We hope these insider tips prove useful when you need to cultivate a relationship with a search consultant! If you have questions or would like to learn more about our Executive Search team, don't hesitate to contact us at colleen.rogers@campbellcompany.com or joey.scheiber@campbellcompany.com. Colleen Rogers is a Consultant, Executive Search and Joey Scheiber is an Associate Consultant, Executive Search at Campbell & Company. They work with organizations across the nonprofit sector to find leaders with the right mix of passion, knowledge, and experience.